It’s my very first packing post! I don’t usually write about what I bring with me when I travel, even though it’s a topic people ask me about. But, before I left for Hawai’i back in January, I did take photos of everything I was bringing with me, so, I figured, why not blog about it? 50L hiking backpack? Check. Free daypack I’ve had since high school? Check. Pillow that unzips into a blanket? Check. Floppy sun hat? You know it. Wondering what to take with you to work on an organic farm in a tropical climate? Or how to fit 2 months worth of items into a 50L backpack? Just feeling a little voyeuristic and want to look at all my stuff? All of these items fit into my hiking backpack and my daypack (pictured above). Toms: Winter is the rainiest time of year on Maui, and all the walkways at Hana Farms where I was living and working turned to mud as a result. 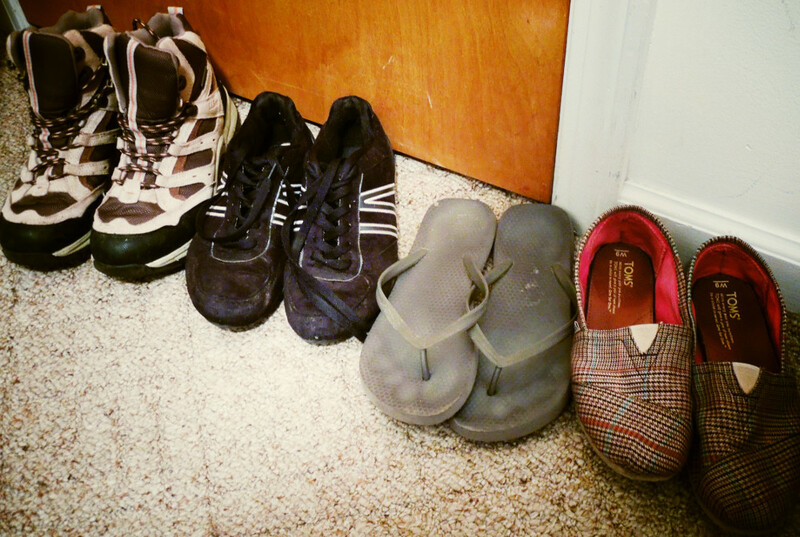 Toms are not known for their traction, plus they’re canvas shoes so they get dirty easily. Not super useful. 2 bars of soap: I’m really not sure why I thought I was going to go through 3 bars of soap in two months. Maybe if I had showered more than once every 2 or 3 days (or 4 or 5), these would have come in handy. 2 Books: I didn’t have as much time for reading as I had hoped I would, and there were lots of interesting books at the farm. Floppy sun hat: While a useful item of clothing, I just didn’t wear it enough to justify the hassle of keeping track of a hat in an airport. It may seem like I packed a lot of clothing, and I definitely could have made due with less than I brought (I had almost 2 weeks worth of tops). However, I was living at the farm for two months, and having so much clothing meant I could do laundry less often. It was convenient because farm work is sweaty and dirty. If I flipped compost while wearing my jeans, I was NOT wearing them again until they were washed. Well… except to flip more compost. If I got caught in a rainstorm wearing one of my hoodies, I was glad to have another dry one waiting for me at my cabin. Plus, my visit didn’t just fall during the rainiest time of year, even when it’s not physically raining, Hana is so humid that you sometimes just feel damp. Clothing will not dry if it’s left out on a line. And clothing that’s allowed to remain damp for more than a couple days will mold. I didn’t bring a lot of electronics (laptop and camera is pretty minimal for a travel blogger…) because the aforementioned Hana humidity has a tendency to ruin people’s phones and laptops. If you’re just visiting for a week or two, you shouldn’t have any problems, but two months living in the jungle meant I left my iPad at home. Luckily, I had no real issues with electronics, but I’m glad I was cautious. Another pair of pants: The mosquitoes in Hawai’i are BRUTAL, and another pair of pants would have provided some much needed protection. Plus, the weather was pleasant, but not hot (70’s during the day, 60’s at night), which meant pants were often appropriate. Rain boots: Most people at the farm worked in rain boots because it was so muddy. And a few brave soles went barefoot despite the threat of poisonous centipedes (not kill-you-poisonous, just worst-bee-sting-of-your-life-poisonous). I switched between my hiking boots (which were too heavy) and my sneakers (which didn’t keep me dry). A regular towel instead of a quick dry towel: Because Hana is so wet, you’d think a quick dry towel would have been a good choice. Unfortunately, my towel got waterlogged early on in the trip and then never really felt dry again. 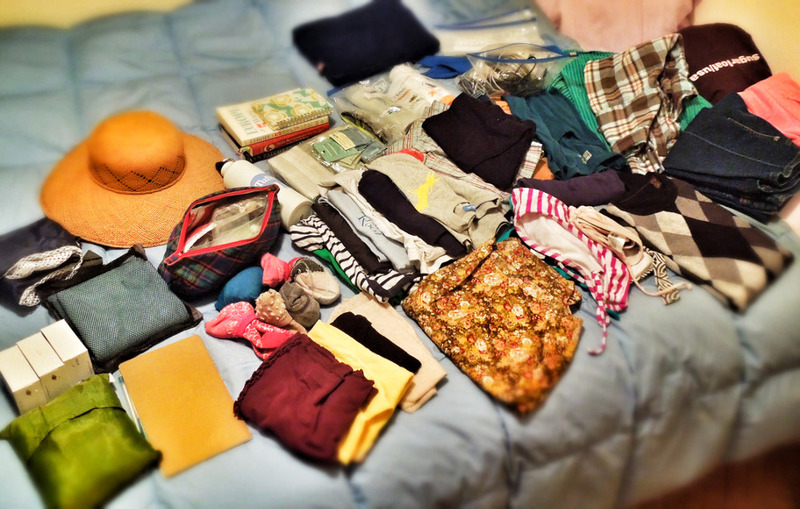 Finally, I want to mention that packing, like every other aspect of travel, is personal. There’s no one right way to fill your backpack. You don’t even have to bring a backpack! When I travel I usually focus on clothing, toiletries, and electronics, and that’s about it. But you might want to bring a favorite stuffed animal or particularly comfortable pillow. A bottle opener or language phrasebook. 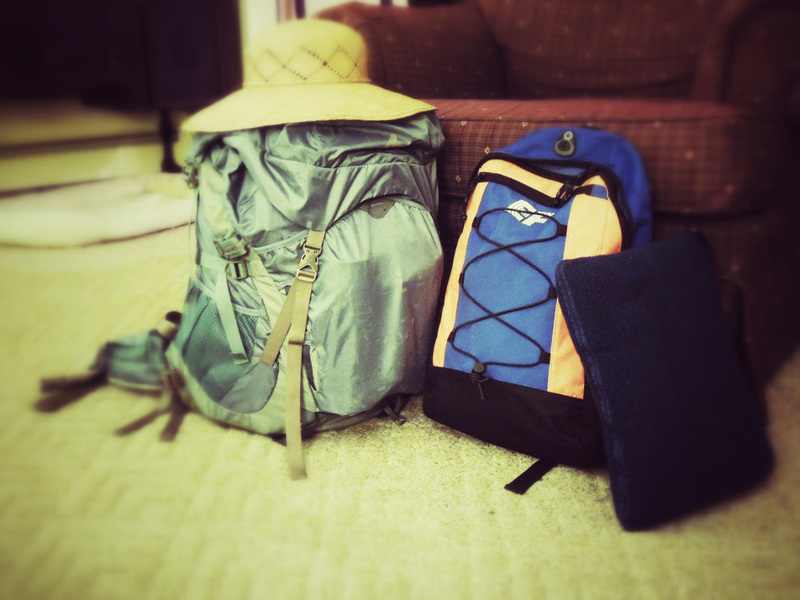 Our packing lists are always going to look different because our preferences are different. That being said, would you be interested in hearing more about my packing strategies? Want to see what I bring on my next trip? What’s in your bags when you travel? I always pack one more pair of underwear than I think I’ll need, and I usually don’t bring enough socks. Sometimes I travel without sneakers, and don’t bring any socks (because all my shoes are flats/sandals/slip-ons) but that usually backfires and I end up with cold toes. I would have brought more dresses if I hadn’t been working at a farm, haha. Dresses are versatile! And I think it makes sense to pack about the same amount for a 2 week trip. What you need for one week and what you need for a month aren’t actually that different. 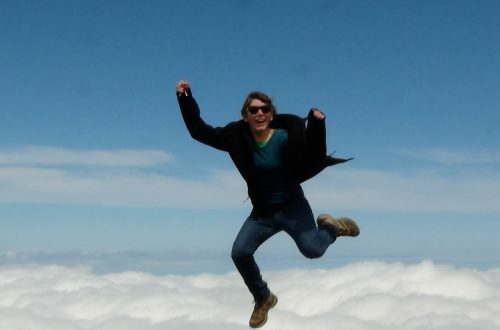 On a month-long trip you’ll just do laundry and get tired of wearing the same clothes. Yeah, that’s true. I’d rather pack on the lighter side because I’ll usually be able to buy or make due without anything I forget. this was seriously the most helpful thing yet. thank you!!! I am getting ready to go to kauai in 3 wks and have not prepped much. it was spur of moment decision d/t hating my corporate exec job and needing out. cheers!! I’m headed to japan WWOOFING for 3 months and have been using your list as a guide for what to bring. I happened to zoom in on the photo and saw a Tufts sticker on the water bottle… starting school there in the fall! Small world. Thanks for the packing tips. 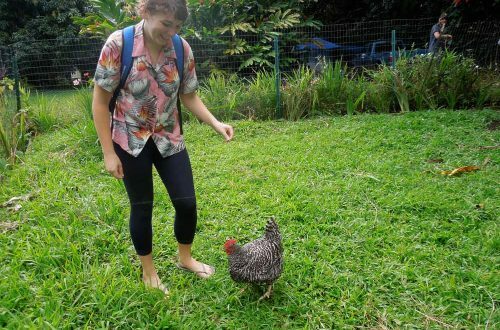 Hi, I’m going to be WWOOFing at a farm in Maui and was wondering what kind of shorts you worked in? I will be there during the dry season May-August. Thanks! Hi Kristina – Thanks for reaching out! I just brought shorts I already owned. I had a pair of jean shorts, a pair of exercise shorts, and a random pair of cotton shorts from Target; But I often worked in long pants (jeans) or leggings to protect myself from mosquitoes, centipedes, thorny plants, sunburns, etc. I also made sure to only bring clothes I wouldn’t mind ruining. If you look at your closet and don’t see anything that fits those requirements, I recommend heading to a thrift store and picking up some cheap, second-hand exercise clothes. Before I went to Senegal (the hottest place I’ve ever been), I went to my local Savers to buy the lightest weight t-shirts I could find and skirts that fell below the knee so I would be appropriately covered but not overheated. Let me know if you have more questions and have a great time WWOOFing!